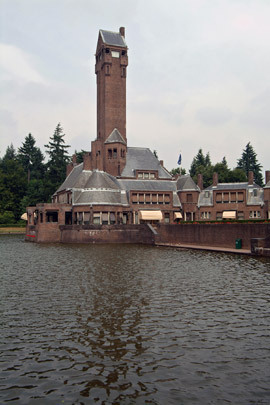 In 1913 Berlage began working for the Kröller-Müller family, designing for them this monumental hunting lodge with its own artificial lake. The plan is shaped like a pair of antlers. This and the stylized cross in the tower are references to the legend of Hubert of Liège, the patron saint of hunting, who was converted after seeing a stag in the forest with a cross between its antlers. The interiors are lavishly upholstered and furnished; the walls are of coloured brick both glazed and unglazed.